A place where eco coffee mornings coincide with direct action training. 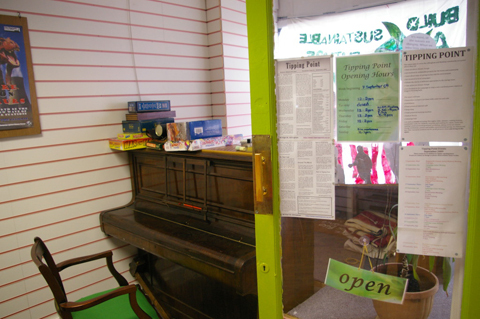 Tipping Point is an info-eco-swap shop on Gillingham High Street, visit this which at first entrance resembles your Gran’s front room…if she’d taken a sudden interest in Climate change and decorated accordingly. We settled down on the squishy sofas and had a chat with Paul, one of the current proprietors brave enough to take themselves out of regular employment and set up shop. While I flicked through Paul’s ‘zine – ‘Holidarity’; an illustrated account of his time hanging out in activist camps drinking whisky and preventing deforestation – a local man came in asking about alternative power solutions for his recently acquired hunting lodge, saying “We need to get this renewable energy sorted out or we’re all going to be in a lot of trouble.” Took the words right out of our mouths, mate. Their aim is to raise local awareness about this rather important issue and inform the community about actions which can be taken in order to prevent the station ever being built. One of the wall displays is dedicated to dispelling myths told about the Kingsnorth plans and there is a plethora of leaflets outlining ways to contest the station. Direct action training began last Sunday where attendees were educated about the whys and wherefores of protests and demonstrations. D-locks and arm tubes provided. Dress warm. While the shop does have a specific aim in targeting Kingsnorth, there is just as much information about climate change in general. On the opposite walls hangs a 6 Degrees display, illustrating the effects of global warming. 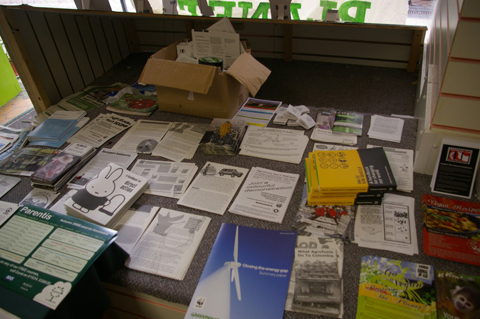 DIY ‘zines nestle next to vegan leaflets behind the window display which contains cut-outs of local people stood beneath floating speech bubbles of their thoughts on Climate Change. 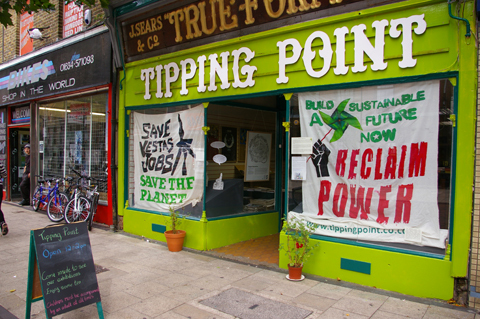 As well as direct action training and campaign letter writing workshops, Tipping Point runs Eco-parent coffee mornings, endangered animal sock puppet making, dance classes, bike repair shops and recently had a lot of fun making paper windmills in their KidSpace. 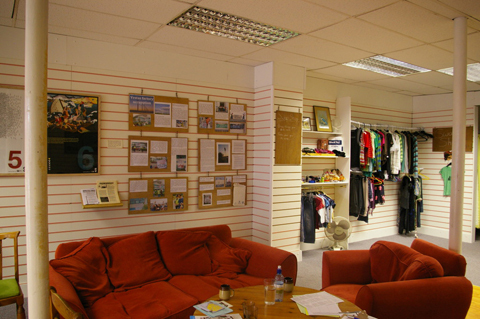 They hope to create a sense of eco-community in Gillingham, making the space into one where people can come to hang out, have fun and learn. Unfortunately the rent, paid for by Lush, is up in February, so it’s important that they leave behind a community wherein people believe that change can be made. 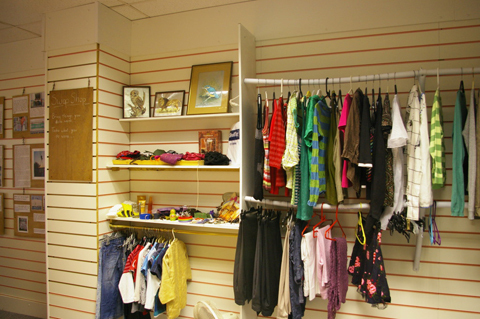 Although it’s difficult to quantify the impact of a project like Tipping Point in these early stages – it’s been there about a month so far – Paul told us that people do regularly drop in for information – or just to find out what the place is! – and often return to tell them about climate conscious changes they’ve made, such as cooking a tasty vegan meal and how it went down with their family. Tipping Point is not a project to be read about and lauded. It’s a hands-on situation which affects us all, and which we can all get involved in. Check out their website, write to the Kingsnorth construction firms, cycle down to Gillingham and make a sock puppet. Little or large, your contribution to this cause might just be the tipping point needed to make the change.